LJN: Congrats on five years of Guildford Jazz - what first gave you the idea you'd like to promote? Marianne Windham: Actually it was a bit of an accident! I'd just given up my job, and was told that the landlord of a local pub was keen to put on some live jazz, so I popped in to have a chat with him. He was very enthusiastic, and he'd recently had a room refurbished that he was very proud to show me. I guess it triggered something in me - there was no-one else doing this locally as far as I knew and I thought it would be great fun to try it out, and to learn some new things in the process. It was a bit of a leap in the dark to be honest. LJN: You don't achieve these things on your own - you must have had help, too? MW: Absolutely! When I started, there were a few close friends who helped me to shape the idea and gave me advice on how best to organise things, and over time a wider group of people have got involved in different ways - doing the publicity, posters, door, photography etc. And a few other friends who come to the club and have specialist knowledge have helped me with business, legal and artistic advice. I really couldn't have done this without having their help. LJN:Have you had role models for what you've done? Or did anyone mentor you? MW: My friends at the Watermill Jazz club in Dorking were (and are) very supportive and are always helpful when I ask for advice. I think they do a fantastic job with their club, and I'm mindful of what they do and try and use them as a bit of a model. There are a few musicians who I can ask for advice too, which I really value. I'm quite new to it all (both the promoting and the music) so I'm always worried I might put my foot in it, but people are generally quite forgiving when I get it wrong! And the musicians have been unfailingly supportive, and very generous with their encouragements. LJN: Do you have advice for someone starting what you've done? Do you have a list of "I wish they'd told me..."
MW: Maybe the biggest thing is to be prepared for a lot of work, and accept all offers of help from everyone! I find it takes a huge amount of my time and I really love doing it, but it does feel a bit overwhelming sometimes. The relationship with the venue is really important. I enjoy meeting and working with such a variety of people, but it's sometimes a challenge, and you have to try and see things from other people's point of view. The people who run venues have their own business needs which you have to respect, but usually you can come to some compromise that works for everyone. It's a good idea to look at who's playing in other clubs nearby too, to make sure you don't clash with their programme. The relationship with your audience is the most important thing though. I really enjoy talking to people at gigs and I'm happy if they've had a good evening. We had to leave our first venue eventually as the landlord wasn't able to fulfil what he'd agreed to, and it was thinking about the audience that made me realise that. I probably should have left a bit earlier in hindsight, and I was a bit sad to leave but it turned out to be a good thing for us. Change is often difficult isn't it, but can lead to new opportunities. LJN: Have you had many all-female bands / female instrumentalists / singers at the club? / Are there established female musicians in the UK who are role models for younger musicians? MW: Yes, we've had quite a few female instrumentalists and singers. I had a season featuring women musicians for our Jazz Cafe at the Electric Theatre a couple of years ago, including one all-female band, which was a lot of fun and which seemed very popular with the audience too! I'm not overly comfortable with too much focus on gender though. During my time in industry there was much debate about the glass ceiling but I never felt too affected by it really - I always felt more limited by my own abilities than other people's expectations! I still feel that now as a musician, but I do see more sexism in the music world which I find rather frustrating. Anyway, back to your question... yes, there are some fantastic female role models. People like Nikki Iles, Annie Whitehead, Issie Barratt, Paula Gardiner, Karen Sharp, Anita Wardell spring to mind - all great musicians who are inspirational both in their commitment and in their accomplishments. I'm sure there are many more too. I have to say though that some of my role models are also men, because at the end of the day it's not really about whether you're male or female, but about how you approach the music, and how open you are to learning and connecting with other people. LJN: What do you think might get more women involved as professional musicians / is there something which holds them back? / Is it changing anyway? MW: Well, I think you have to be very single-minded to be a professional musician! Also jazz music in particular seems to need a certain appetite for risk, and in general I think women are more risk-averse than men. Women are also more collaborative by nature, so we don't perhaps embrace the rather combative approach to jazz that you sometimes see on the stand! I think it's not dissimilar to the business world - there are relatively few women CEOs after all, perhaps for the same reasons. So is this apparent timidity, or fear of not getting it right, or whatever it is, something that's inherent in the nature of girls, or is this a learnt response? This must be something we can change, surely! Having said all that, I'm sure it is changing - it's fantastic to see such talented young female musicians on the scene now and after all, how many professional female musicians (or lawyers/doctors/physicists...) were there 50 years ago? LJN: What do you think you have done / can do to shift the balance/ any ambitions in that direction? MW: Well, I do try to be inclusive. I love organising workshops and jam sessions where everyone is welcome, no matter what gender or ability or age or anything, and I've enjoyed organising for musicians to visit local schools to encourage and inspire children to get into playing jazz, whether they're male or female. I'd like to do more of this, definitely. I'd like to have more women musicians to come and play at the clubs too, both in Guildford and Fleet, and am always on the lookout for people who I can invite. I really enjoy playing with women too - it would be fantastic fun to have an all female big band here at some point! LJN: What events are there for the anniversary coming up? MW: We've got a few different events coming up this month. Our main anniversary gig is at the Guildford Rugby Club Pavilion on March 9th, with Alan Barnes which I'm sure will be a lot of fun! I'm also involved in helping the Guildford Spring Music Festival for the first time this year and Tina May is performing at the Electric Theatre on the 18th, with a workshop for young musicians beforehand with Nikki Iles. 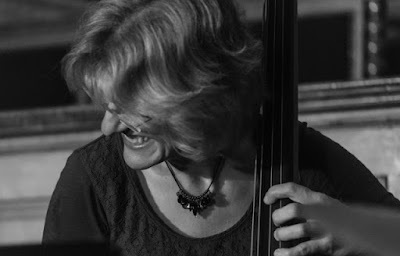 There's also a jam session for local musicians at the Keystone pub on the 20th, and finally on the 29th it's the Jazz Cafe, with Karen Sharp. Something for everyone I hope.